Applications: Designed for handling refined products at the process plants in the oil-refining industry. May be also used to pump over industrial water through processing trains in the oil-refining industry as well as for handling water and condensate in the steam and water circuit systems. Design: АNDD series pump units consist of a centrifugal pump and an induction motor in the explosion-proof version, which are mounted either on a common base plate (if the nominal power of the motor is less than 400 kW) or on separate base plates. The pump and motor shafts are connected by means of a flexible coupling. The pump units shall be rigidly anchored to the foundation, and piping shall be also rigidly connected to the pumps. The pumps as components of the pump units are electrically driven horizontal, between-bearings, single- or two-stage centrifugal pumps with double entry impellers. radially split, with a tangential semi-spiral inlet hydraulic passage and a circular outlet hydraulic passage (in case of NDD 600-320 U2, NDD 500-290 U2, NDD 800-230 U2 and NDD 850-180 U2). radially at side (suction) and vertically to top (discharge) in the NDD 600-320 U2, NDD 500-290 U2, NDD 800-230 U2 and NDD 850-180 U2 pump makes. Counter flanges have a weld neck. The rotor axial thrust is hydraulically balanced. The residual axial forces arising as a result of an uneven wear of sealing surfaces in the running clearances are taken up by the bearings. Casings of the pumps for hot refined products are supported in the horizontal plane near the shaft centerline to accommodate thermal expansions. In order to allow for free expansion of static components whilst maintaining coupling alignment, the pump feet on the drive side are rigidly dowelled to the base plate pedestal and the other end is pinned so that it should be axially moveable. The rotor in the NDD 140-140, NDD 420-100, NDD 420-200, NDD 800-30, NDD 800-60, NDD 1100-60 and NDD 1200-70 pump models is carried by the oil-bath lubricated antifriction bearings with forced cooling. The rotor in the NDD 600-320 U2, NDD 500-290 U2, NDD 800-230 U2 and NDD 850-180 U2 pump makes is carried by the pressure lubricated plain bearings, with lube oil supplied by a pressure lubrication installation. 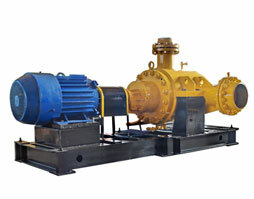 single seals provided with a liquid cooling system in case of the pumps for industrial water. Upon the Customer’s request, pumps intended for handling industrial may be furnished with packed glands. Handled medium near the shaft seals is cooled by cooling liquid supplied into the thermal barrier chambers. Sense of rotation of pump shaft is shown with a rotation arrow attached to the pump casing or to the bearing housing on the drive side.